I always thought that countries whose cultures have a long history of accepting psi phenomena have a better chance of conducting effective experiments and promoting scientific research in the field of parapsychology. The reason for my thoughts was that, hopefully, the scientific establishment in these countries is not as a priori averse to these topics as their colleagues in the western universities. I had my hopes that countries like China and India, from which many of these traditions come, will take a deeper, scientific look at the claims of siddhis, Qi, etc. That being said, I also thought that they don’t do it much or at all, either because the political establishment was against it, or because there was no funding or public interest since these abilities were already accepted in the culture and thus didn’t need much research. Luckily, it seems that at least in China, the research of topics in parapsychology is increasing, and becomes more open. The fantastic site Psi Encyclopedia has an article from last year published by “Professor Yi-Fang Chang, a physicist and experimental parapsychologist at China’s Yumman University.” exactly about this topic: Psi Research in China. I suggest you read the whole article, as it’s written well and has a lot of information, but here are some quotes from the article that are the highlights, as far as my interests go. The physicist Leping Zha introduced the systematic study of psi in the People’s Republic of China in the late 1970s. In China, psychokinesis is included in the ‘somatic sciences’ that study exceptional functions of the human body such as qigong. 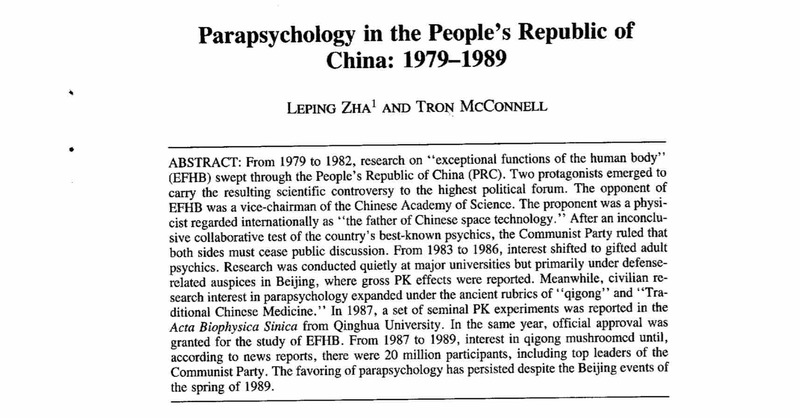 Leping Zha’s historical account of the three phases of China’s modern somatic sciences between 1979-2001 includes reviews of hundreds of claimed successful experiments across the parapsychology spectrum. The Institute of Somatic Science of Yumman University was founded in 1980, where successful experiments have included the advancing and retarding of a clock by means of mental intention in the absence of any known physical force. The article also lists the working theory of Chinese scientists as to how this works, research into earthquake predictions and a summary of scientific publications. I found some additional information on the topic in an article from 1991 in the American Society for Psychical Research. The article can be downloaded in PDF form from CIA library: https://www.cia.gov/library/readingroom/docs/CIA-RDP96-00792R000300270007-9.pdf . It’s written by Leping Zha (see a quote above) and Tron McConnell. Might be worth a read to learn more on this topic. The post Parapsychology Research in China is on the rise appeared first on Mind-Energy.